You’re not dreaming – the perfect midnight blue does exist! With its subtle shimmer to make your nails twinkle like starlight, Marnie brings deep color to your manicure to take you through the night! Its intense, cool color is perfect for winter. 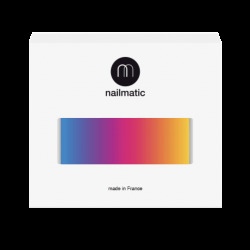 Our PURE color range is a collection of cleaner, greener nail polish. And to make your manicure even easier, we have also created a 2-in-1 Base & Top Coat. So no excuses for skipping this step! What does that mean? Our PURE color range is formulated using natural, plant-sourced ingredients, including renewable raw materials such as wheat and cotton. As a result, these polishes contain plant-derived solvents rather than those made from petrochemicals. As for toxic ingredients, we’ve sent them packing. Our PURE color range is absent of: paraben, toluene, dibutyl phthalate, formaldehyde, xylene, styrene, camphor, resin of formaldehyde, benzophenone-1 and nanoparticles. Designed, developed and made in France. Clean, dry nails are the essential starting point for a neat manicure. Put the crisp packet down and wash your hands! 2. Apply one coat of Marnie in three brushstrokes: one down the middle followed by one either side. 3. One coat of color is enough, but for increased coverage, go back in with a second coat. 4. Add a layer of top coat to lock your color in with a high shine finish. Pop this color on with jeans, a biker jacket and OTT accessories (think trophy earrings or a statement necklace). How long should you really wait for your nails to dry? Give it at least 15 minutes, by which stage your nails should be comfortably touch dry (but avoid doing any heavy lifting for a bit longer...). Ingredients: butyl acetate, ethyl acetate, nitrocellulose, isosorbide dicaprylate/caprate, adipic acid/neopentyl glycol/trimellitic anhydride copolymer, alcohol, acetyl tributyl citrate, isopropyl alcohol, stearalkonium bentonite, calcium titanium borosilicate, diacetone alcohol, n-butyl alcohol, borago officinalis (borage) seed oil, phosphoric acid, tin oxide, hydrolyzed corn protein, hydrolyzed wheat protein, hydrolyzed soy protein, leuconostoc/radish root ferment filtrate, ci 77891 (titanium dioxide), ci 77510 (ferric ammonium ferrocyanide), ci 19140 (yellow 5 lake).